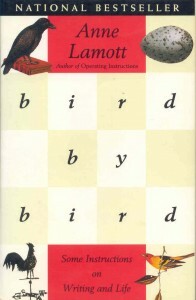 Anyone who enjoys writing should read Bird by Bird. It’s one of the most intriguing books on the craft I’ve read. It’s a quirky mix of practical advice and motivational speech that almost always works, and while Lamott’s humor becomes predictable in places–you get pretty good at guessing when she’s going to throw in a zinger–the fact is, her one liners and random asides are really funny. Fun, funny, poignant, practical, motivational. You simply keep putting down one damn word after the other, as you hear them, as they come to you. You can either set brick as a laborer or as an artist. You can make the work a chore, or you can have a good time. You can do it the way you used to clear the dinner dishes when you were thirteen, or you can do it as a Japanese person would perform a tea ceremony, with a level of concentration and care in which you can lose yourself, and so in which you can find yourself. Definitely worth the time and money to get and read this book. I read this book in a creative writing course in college and loved it. Traveling Mercies is also a great book!